No need to panic, just because a frail human body—made up of eminently breakable bone, skin, and sinew—is about to step into the vacuum of space, protected only by a reinforced bouncy castle. EVERYTHING IS FINE. After finally getting its inflatable space house up and running on the second try, NASA is about to hit another milestone: It’s going to send a person inside to see how it looks in there. On Monday, astronaut Jeff Williams will become the first person to float foot into BEAM, Bigelow’s test expandable space unit, which is currently screwed to the side of the ISS. This first inflatable space walk is actually happening a little off-schedule. It was supposed to have happened yesterday. But, after BEAM refused to expand more than a couple inches outward in NASA’s first attempt last week, they called a temporary halt until they could figure out the source of the unit’s lost pressure. 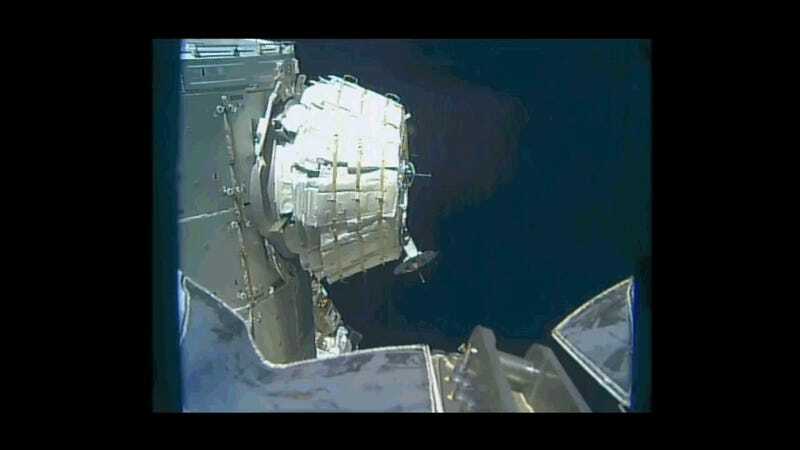 Finally on Saturday, they were able to get BEAM fully expanded. The first order of business on Monday will be for Williams to run an air sample and install sensors to test how the unit is handling the barrage of radiation and space trash that regularly flings itself against the ISS. Assuming that all goes well over the two-year test, similar and more elaborate space houses (as you can see from the picture, the inside of BEAM is currently pretty spartan) may one day be deployed to the ISS and even further into space.